Heath Wedding Lounge | come blow bubbles! Anyone getting engaged and planning a wedding in the Bay Area? 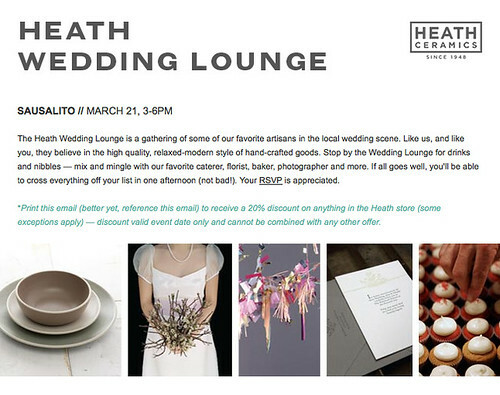 If so, you should be at the Heath Ceramics Wedding Lounge on March 21! It’s going to be a fantastic event complete with “drinks and nibbles” and some of the most amazing wedding vendors. You even get a 20% discount at the Heath store if you attend. 1. The photographer who shot my wedding, Edyta Szyszlo will be there along with two helpers–Lindsay of Lindsay Covets and myself! 2. Alison Events will be there. While I did not use Alison Events for my wedding, a long-time friend works there so I have firsthand knowledge of how great they are. 3. I am in love with Heath Ceramics. Their tile, their dishes, just everything. I also am excited because a project I worked on at my old firm is used in Heath advertisements but that’s a totally separate reason I get excited about Heath. Discounts, drinks, munchies, wedding fun and great vendors! Enough reasons for you to be there? Come on over and join in the festivities.